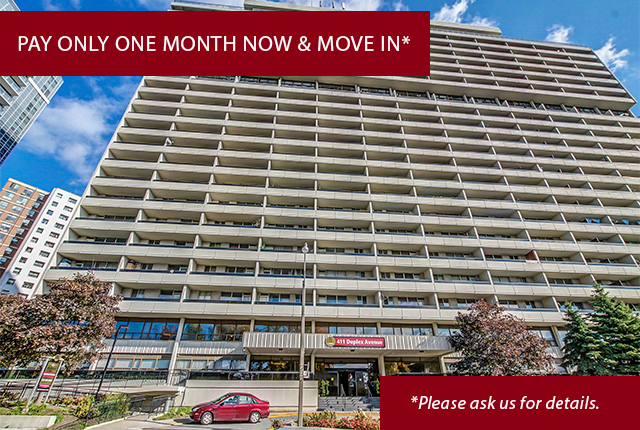 Located in the heart of midtown Toronto, residents in these luxurious midtown Toronto apartments for rent enjoy the inside walk to the Yonge & Eglinton subway station. It is also just minutes from the cosmopolitan downtown core of Toronto. With an almost perfect Walk Score of 98 and Transit Score of 95 the combination of shopping within the Yonge-Eglinton Centre (411 Duplex and 33 Orchardview), including a 24 Hour grocery store, great restaurants, nightclubs, theatres, schools, daycare centres and great parks, make Yonge Eglinton Apartments the ideal place to call home. Ask our friendly staff about our beautiful rooftop patio and sundeck.